When I was offered goods from CSN Stores, I opted for games again. Why not? :) We love games, lately. 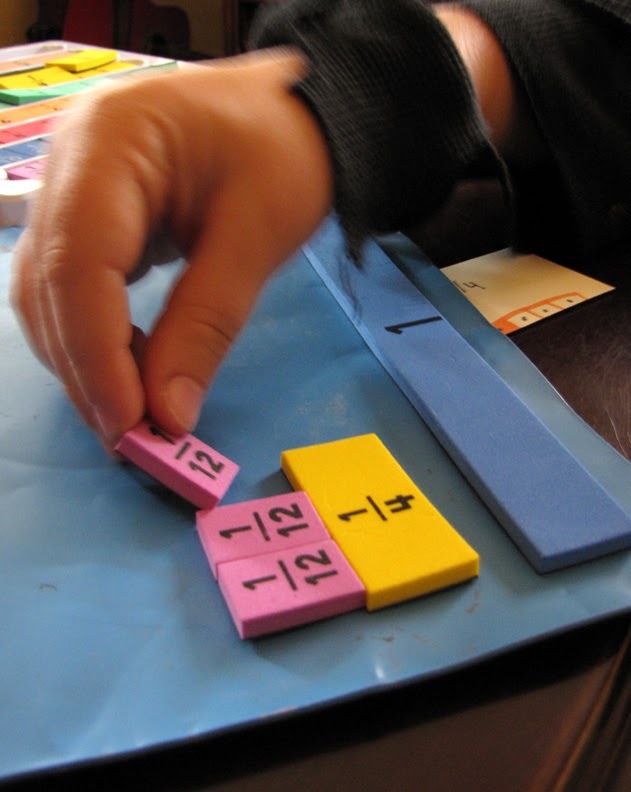 Today we received Foam Magnetic Fraction Strips from Educational Insights. 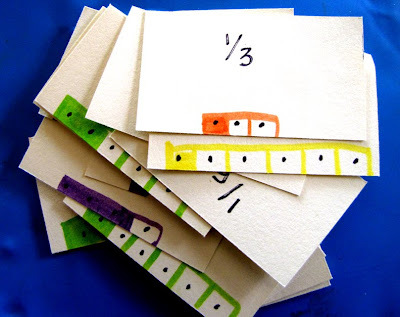 It's not a game, rather just fraction strips. I'm sure many of you have created this same sort of game with or for your children, but here's how I did it. I just used dice and made cards. Since our pieces contain 1/2, 1/3, 1/4, 1/5/, 1/6, 1/8, 1/10, and 1/12, I made our cards accordingly. To make the game friendly for Maddie, I put little dots at the bottom of the card so that she might understand the concept more easily. and we put together what our card says. The first point must be made with the fraction the card reads. The bonus points would then be made with two 1/6's, and/or four 1/12's - whatever is equal value to your card. and you may also take pieces from others if someone else is holding the piece you need! When the pieces are used (bonus pieces included) you place them back into the initial pile for re-use. If you like the idea of "Winning", you could say whoever is the first to a particular amount of points (one point for each correct fraction made), we agreed upon 14. 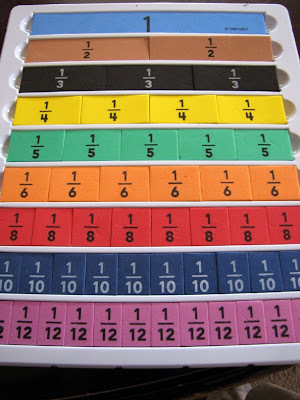 You could alternatively have score sheets with circles, and the first one who uses up at least one of each denominator wins - halves, thirds, fourths, fifths, sixths, etc, wins. I liked this game - it's a tangible way to see how numbers and sizes fit together - ie common denominators and similar (but different) proportions. Very cool! We have some plastic ones that fit together, I'll definitely make this game to go along with it. I love your ability to effortlessly make up games. Such a useful & an awesome creative talent! I considered getting games from CSN the last time I did a review...maybe next time! Did you get Totally Tut? I can't wait to see the review on it--it looks good. Looks like fun! 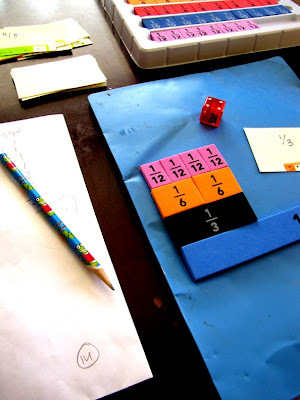 There was a great pizza fraction game idea in Family Fun recently that I've been meaning to print out and play. that is so very clever...and fun to boot! I love the fraction strips. Very cool. And what a creative way to game them up for learning purposes. So fun. Thank's for sharing this great idea!